It took some time, but I finally converted. 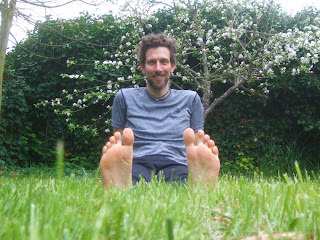 I'm now officially one of those freaky barefoot runners. I began running in zero-drop shoes close to two years ago. Doing so has cured my plantar fasciitis and strengthened muscled I never knew I had. It's been a great change and I love it. But as I've mentioned before, healthy minimalist running form goes well beyond simply landing on your forefoot. I had to learn this lesson the hard way with an ankle injury diagnosed as posterior tibial tendonitis. Most likely, this resulted from extreme forefoot running, meaning that I stayed on the balls of my feet too much and rarely let my heels touch the ground. Add to that the fact that I increased my distance well beyond the recommended 10% per week, and I was more or less begging for an injury on an overused muscle. All things considered, I was lucky. 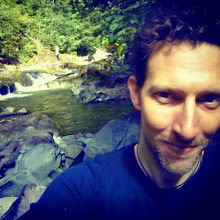 A short break, two inexpensive adjustments from a miracle-working chiropractor (thanks Dr. Bilby!) and a few massaging and stretching exercises were all I needed to recover. I'm really good at taking hints, though, and I had to ask myself, "Am I heading toward other injuries with my running habits?" That's when I began researching minimalist injury-free running in depth, and that's when I came to the conclusion that even if I wanted to run well in shoes, I should learn to run without shoes. "Frankly, if all you did was take off your shoes, go for a run, stop when it hurts, and experiment to find ways of running that don’t hurt, you would learn more than I, or anyone else, could tell you." The same advice was repeated in interviews, articles and books I came across by Barefoot Ted, Michael Sandler and the many other minimalist gurus and professors out there. 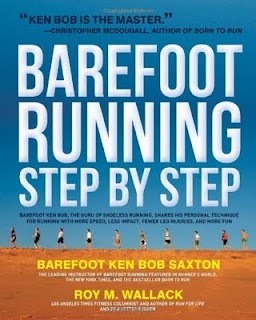 All of this was persuasive, but the final stroke came from reading Barefoot Ken Bob Saxton's book Barefoot Running Step By Step. There was really nothing revolutionary in Ken Bob's book that I hadn't heard before, but it was all laid out so simply. Instead of hundreds of pages of specifications for positioning every muscle in your body just right while you run, he had a handful of easy tips for proper running form and a simple schedule for adapting to bare feet (I don't mean to say those detailed books aren't useful, just that Ken Bob's simpler ideas are easier to start with). For those who do want to run in shoes, he presented a strong argument that running barefoot will help you develop proper running form that you can then maintain in footwear. As a Soft Star shoe elf who prefers having some covering on my feet, his words really hit home with me and I began running barefoot the next day. The idea is easy to grasp: when you're barefoot, your body makes quick adjustments to anything that causes pain. It doesn't matter how thin or minimal your shoes are, nothing is the same as skin on ground. For example, when I wear shoes, I consciously try to avoid shuffling and scraping my feet against the ground before I lift off, and it takes attention and work. When I go barefoot, I fix that automatically in about 5 seconds. If I didn't, I'd be wallowing in pain and leaving a bloody trail of footprints on the pavement behind me. And yes, I did start running barefoot on rough pavement and gravel. This may seem contradictory to the common sense of starting on soft surfaces, like grass, but the point is to learn to step lightly and quickly with a high cadence. Shoes and grass don't motivate you to do this. Bare feet on gravel does, and you learn it fast or your body screams at you. I'm taking it slow and following Ken Bob's schedule, which means running for five minutes every other day for four running days, then upping it to ten minutes every other day for four running days, then fifteen minutes, etc. It's been about a month now and I'm up to 25 minutes running barefoot, which covers a little more than two miles. My feet are sore at the end of these runs, and sometimes I've had to wait an extra day before running again, but they've never started bleeding and my tolerance for rough ground has significantly increased. And if you never tried it, running barefoot does feel incredible and liberating. I'm now ready to start running in zero-drop shoes again and seeing how well I maintain the new form (I have two new pairs of RunAmocs I'm anxious to try out), although I plan to incorporate some barefoot time into my regular training. And yes, I'm still continuing my Minimalist Monday running workshops in Portland. I'm curious to hear how their teachings compare to Ken Bob's, and I do think there is great value in learning the more complex ideas behind running injury-free. My feet and body feel great and I'm still working to repress the urge to just take off and run as far and as fast as I can. Ken Bob calls that BRES: Barefoot Running Exuberance Syndrome. It's tempting, but I don't need any more injuries. The days that I can just let go and run like a mad will come in time, and I'll stay healthy when they do.